In 2017, we searched in 7 recruitment plots for flowering Echinacea angustifolia plants. For each flowering plant, we took demographic data- counting the number of rosettes, counting the number of flowering heads, and shooting a GPS point of the exact location of the plant. Four plots had no flowering plants, but three of the plots had a total of 43 flowering Echinacea plants. Of the plots with flowering plants, two plots (with 35 of the flowering plants) are located at Hegg Lake, a site managed by the Minnesota DNR, and one plots (with 8 flowering plants) is located at Eng Lake. This recruitment experiment was originally established in 2000 to quantify seedling emergence and juvenile survival of Echinacea angustifolia during its reintroduction to sites with varying land-use history and burn schedules. Before 2014, detailed data was collected on each plant in the plots. Since 2014, we’ve censused each plot yearly to collect demographic data for every flowering plant. 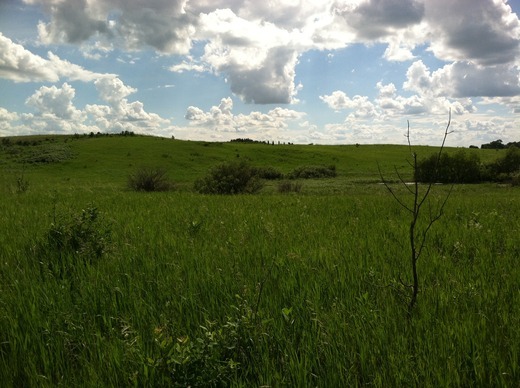 Location: Ten study plots on state land with different land use histories: old-field and restored grassland. Products:A paper (Wagenius et al. 2012) published in Restoration Ecology. You can find more information about the effects of fire on seedling recruitment of Echinacea angustifolia on the background page for the experiment. 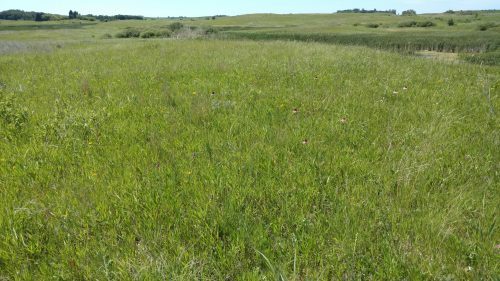 Description: The Echinacea Project’s recruitment experiment examines the germination and survival of Echinacea angustifolia seedlings in oldfields and restored grasslands under different fire regimes. 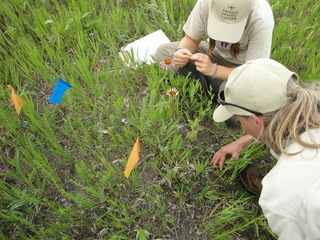 In 2014, Team Echinacea searched for and measured Echinacea plants in 60 study plots spread across 10 experimental blocks. After data collection was complete, we mapped all newly flowering plants. The goal of this study is to identify the environmental factors that influence the recruitment of seedlings and the long-term fitness of Echinacea plants. Products: Raw data taken on paper were entered into database and verified. 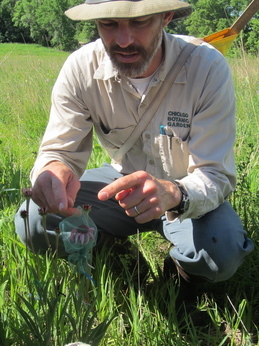 Flowering plants with new tags were mapped and the spatial data is located in the 2014 SURV files. 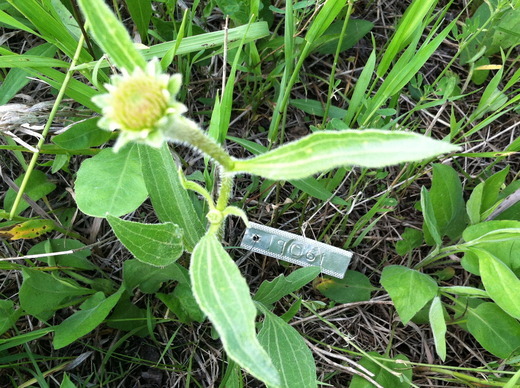 Flowering plants with old tags were not mapped in 2014. Seedlings in Q2, recruitment experiment, and my first tag! 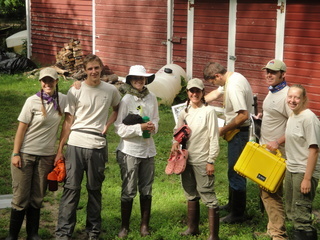 We started out the day doing what we do best: searching for seedlings in Experimental Plot 8 (a.k.a. Q2). Having braved formidable winds to plant them late last October, Stuart, Gretel, and Ruth were visibly relieved to see them pop up this spring. Since last week Team Echinacea has been diligently tracking down each seedling and “naming” them with colored toothpicks and row location coordinates, accurate to one centimeter. In the afternoon we located and counted Echinacea in the recruitment experiment, a continuation of the project described in this paper. The procedure is really fun: we find the boundaries of the plots with metal detectors, triangulate points, then search within an area exactly the size of a regulation 175-gram Disc-craft Ultra Star disc (a.k.a. frisbee). Go CUT! The best part of the day was tagging my first Echinacea. Maybe it just lost its old tag, but I like to think this is the first time this plant has ever born the silver badge. Sometime 10-12 years ago, this seed was planted. 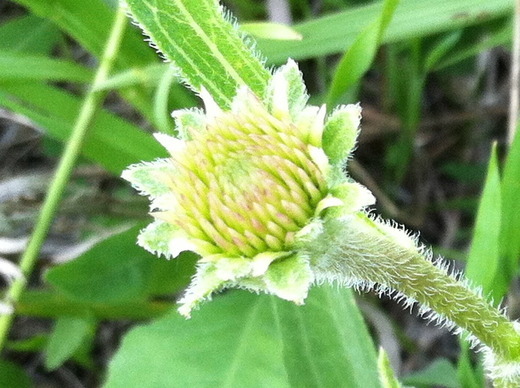 Now that it is finally about to flower, it has the honor of going down in history in the databases of the Echinacea Project, living out the rest of its life in the service of science. This 23rd of June, 3.65 m from the southwest corner and 0.79 m from the southeast corner of the northeast plot in Recruit 9, I named a flowerstalk “19061.” Isn’t it beautiful? Doesn’t the flower head look ripe? Stuart says we may start to see flowering as early as the end of this week! A nice day is Douglas County is a very nice day. These were supposed to have nails, but we were unable to find them. 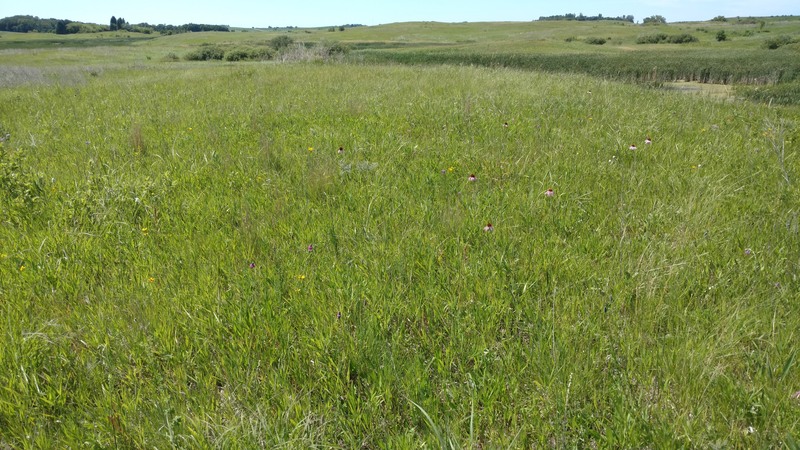 In a paper just published in Restoration Ecology, Echinacea Project researchers report that establishing Echinacea angustifolia in existing prairie restorations and abandoned agricultural fields requires more than 20 seeds for each plant that germinates and survives to flowering. Plants start flowering about 10 years after sowing. 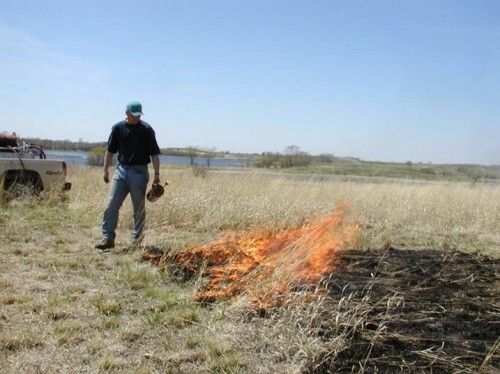 Also, burning the prairie before broadcasting seeds helps emergence and survival. I wrote this up last week, but neglected to post it on the flog. Here is a detailed protocol for the 2011 recruitment searches. See Wagenius et al. 2011* for a description of the seedling recruitment study. *Wagenius, S., A.B. Dykstra, C.E. Ridley, and R.G. Shaw. 2011. 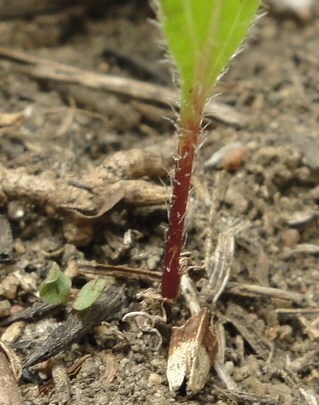 Seedling recruitment in the long-lived perennial, Echinacea angustifolia: A 10-year experiment. Restoration Ecology. Exciting news! Amy and Hillary found some seedlings at a Hegg Lake plot, the one thats on a hill (the hill with all the phlox on the side) near that blind corner. Anyway, there were nearby flowering plants so its great their reproducing! 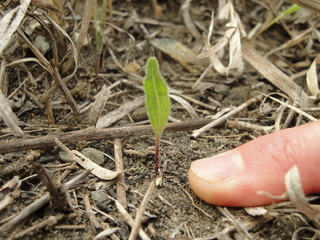 There were also a couple seedlings found outside the frisbee sized circle area. This one is a close up of the shriveled cots (with an achene next to it), can you see it!?! The seedling finders, working hard! 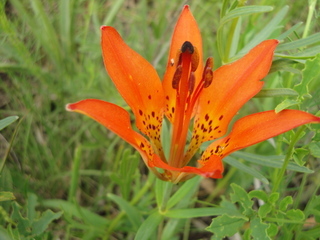 This is just a prairie lilly (Lilium philadelphicum) that I spotted at Staffenson. First time ever seeing one and I think their beautiful! Of the many, many other terrific things that I’m excited are being accomplished, I’ll just comment that I’m happy to see Megan’s post that she has sampled pollen and stored it in different conditions to check its long-term viability. Finding a way to keep pollen viable for a month to a year would pave the way for experiments I thought up while observing pollinators out at LF on July 7. I see that Megan noted the amount of pollen available for that sample wasn’t large, so it would be great if another set of samples could be taken, also so other plants are represented. Apparently there is some question about what I have been doing lately. Daniel was partly right–data entry has been on my list. Remember checking the recruitment zones earlier this summer? And being rewarded with all those six packs? Well, there were some ambiguities in the data. I compiled a list 2009 zones to check.xls of all the things we need to check in the recruitment zones. Some of these (checking burn status) can be taken care of with a visit to the plot; other ambiguities may be cleared up by taking some tissue samples and sending them to Chicago for microsatellite analysis.